It's been a while since my last garden shed update and I've done a few more things. Not directly on the shed itself but around the shed. You'll see in the pictures below that there are two distinct garden areas near the shed. One directly in front of the shed and the other to the left (eastern) side. In between the two gardens is a grass pathway plenty wide enough for people to walk through and easily wide enough for a riding mower also. Today I'll show you an overview of the gardens (which of course are still a work in progress - isn't it always?) and tomorrow I'll show a few of the plantings. Here's the front of the shed and the main planting bed. On the left you'll see a 'Shenandoah' switchgrass with a sunflower peaking out from behind it. 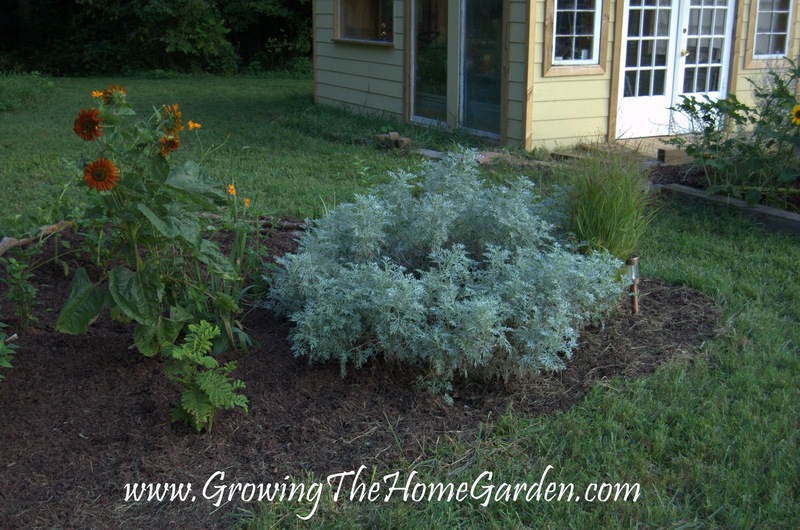 Directly to its right is a planting combination of Russian sage, rudbeckia, and Shasta daisy. Stepping stones were collected and placed where the gardener (that means me) has easy access to the front door by traversing through the garden. 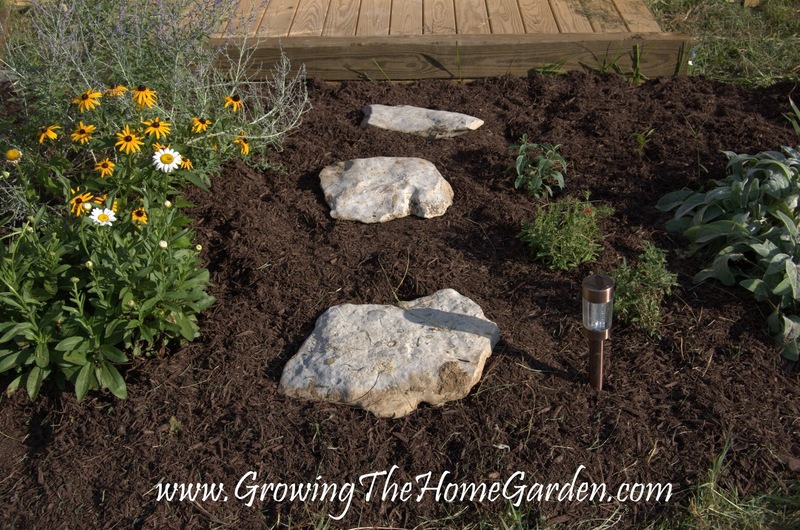 Here's a close-up of the stepping stones. I'm a big fan of natural rock in the garden. If we slip a little more to the left you can see how the garden fits the front. I haven't measured it but since the shed is twelve feet across the garden should be somewhere around 16-17 feet long and about 5 feet wide. Eventually I hope to construct a small walking bridge out of reclaimed lumber to the right side of this garden where the willow tree in the distance can provide plenty of summer shade. It should make a nice garden setting. This shot is more of the plants in the eastern bed but I had to sneak in some plants! Sunflowers to the left with seed sown cosmos popping up here and there. 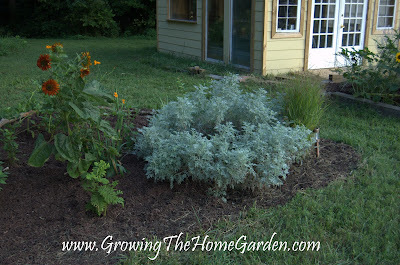 The big silver plant is a favorite of mine, 'Powis Castle' artemisia, that I grew from a little cutting. Come back for more from the Garden Shed! This project seems so do able for us unskilled folks. Love to follow your progress. 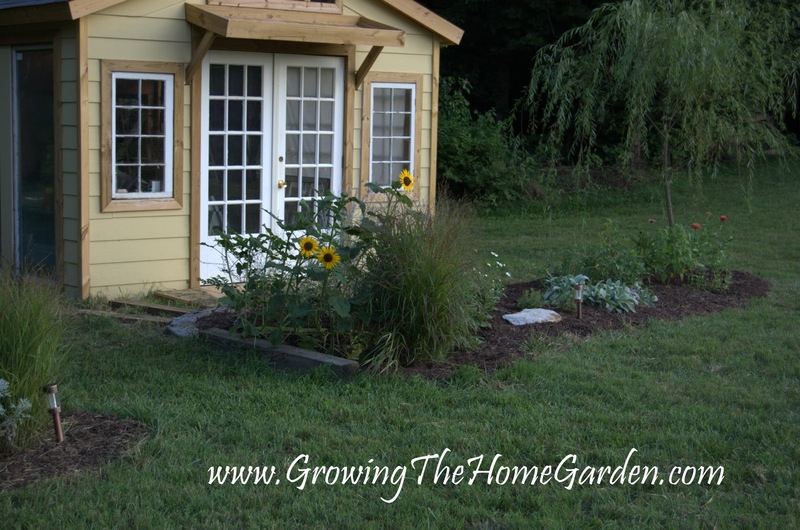 Shed & gardens look terrific. I like to follow how all is coming about. I've been begging my husband for a garden shed. I'll have to show him these impressive photos. He'll be amazed! Great job! Looks awesome. 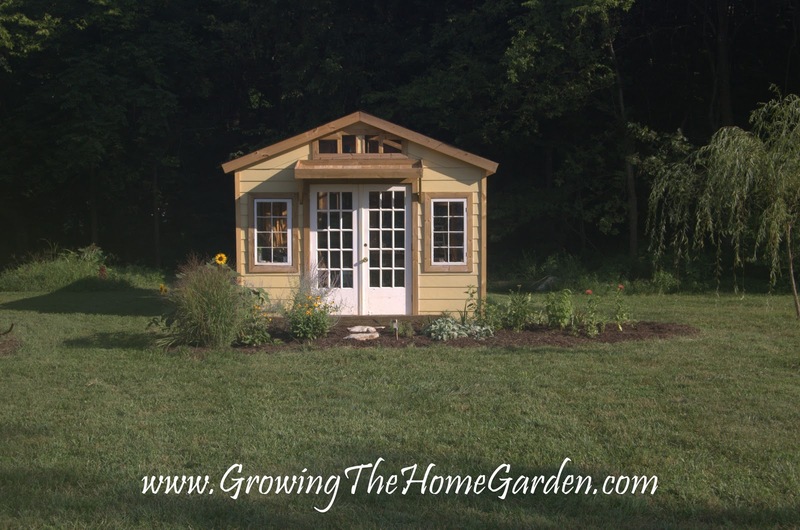 I love the look of this garden shed. 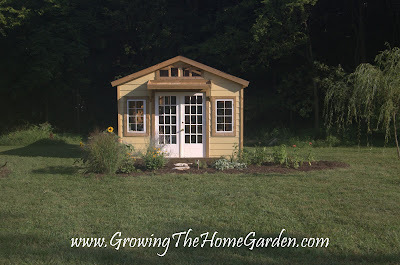 Years ago those ugly sheds that you put together from a kit would take away from the look of the garden. Yours certainly adds charm to the landscape. It's very doable just takes some time and effort! I'm glad you like it. The doors all have been repurposed from other locations which helped to inspire the concept. Thanks Eileen! That's the best kind of compliment - to know that it enhances the garden. I love how your shed turned out. Was just here at your site catching up. Love the brick floor too.